I finally got to meet Chloe's boss Ralph Petty the other day. I've been hearing about Petty Atrocities for over a year, and she's right about one thing: Petty is a complete jerk. I'd been called out to Old World Wisconsin, the big historic site where Chloe works as a curator. 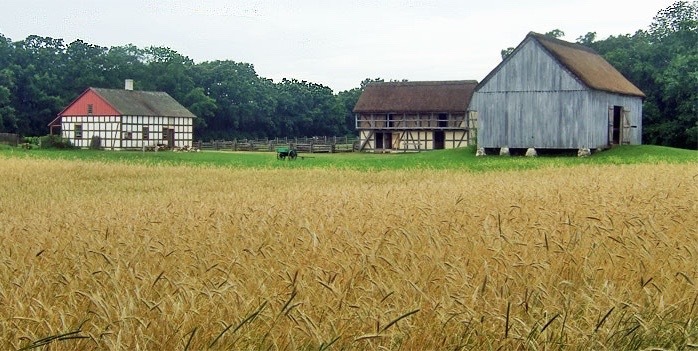 A dead man had been found at one of the restored farms. You'd think that under the circumstances, the site director would be respectful to the first cop on the scene. Instead, Petty roared up in that big red Harley Davidson Sportster he rides and tried to take charge. He snapped at Chloe. Then he jumped to the conclusion that a man had died because the interpreter working at the farm had done something wrong. Then he tried to override my authority by barging over to examine the body himself. "I can not allow you to do that." I clamped one hand on Petty's forearm. "This farm may be a crime scene." "Crime scene? That's absurd." Petty tried to wrench his arm free. The Schulz Farm at Old World Wisconsin, where the body was found. I waited a couple of beats before letting him. In spite of present circumstances, I kinda hoped that Petty would cross the line. Do it, I urged silently, and see what happens. I'd probably get some big-time boyfriend points if I arrested Petty. The site director had been giving Chloe a hard time since the day she started working there. He'd already tried to fire her once. Petty disappointed me that day by giving up the challenge. But I've since come across a surprising bit of information about site director Ralph Petty. Using it might keep him from harassing Chloe. Or the whole situation might blow up in my face, and I could find myself keeping Chloe company in the unemployment office. I can't decide if I should stay out of Old World Wisconsin business and let Chloe take care of herself, or if I should confront Petty with what I know and take a chance at gaining her a bit of job security. GIVEAWAY! 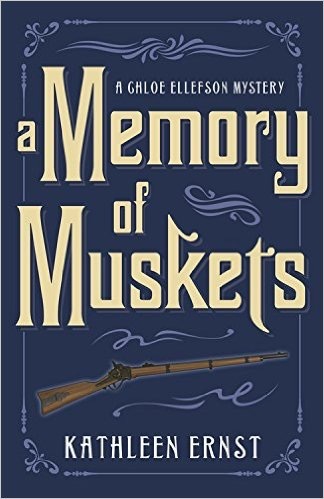 Leave a comment below by midnight on June 19th for a chance to win a copy of A Memory of Muskets -- or, if you prefer, any other volume in the series. Please include your email (such as reader -at- reader.com). Good luck! To learn more about this award-winning series, see Kathleen's website. This sounds fun....? Never stay out of anybody's business methinks lol! I love this series! I hope you write many more. This is a new to me series. Thanks for the chance, sounds great! Maybe Petty committed the murder & you won't have to directly help Chloe with the job security. 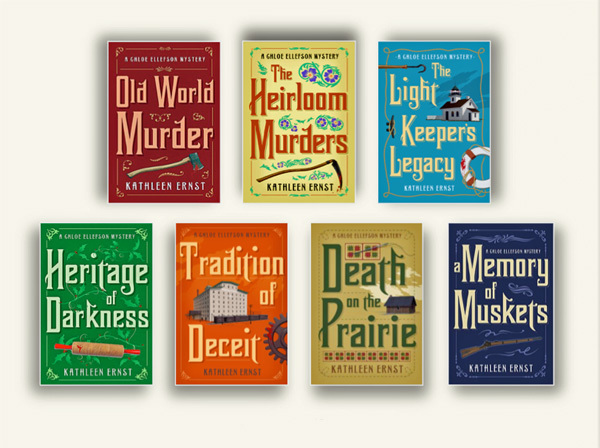 I love your series and have recently finished "A Memory of Muskets"; so full of mystery and intrigue. I enjoy the relationship between Chloe and Officer Roelke and his family, but of course my favorite book in your series so far, has been the "Light Keeper's Legacy" because of its setting on Rock Island, one of my favorite places! Love the sound of this series. I really like reading historical based books and I would enjoy reading a book in this series. It doesn't sounds like she currently has great job security anyway, so my advice to the character is go for it! Thank you so much for the chance to win! This is a great series. I'd love to win a book. New author. New series. Hoping this will be an early start to what looks to be a very interesting read. As for should you. Or should you. Depends on what that info is. And how you use it. Petty sounds like a petty type of character. People like that really are not worth the time to deal with. No matter what you say or do it is going to be wrong. Not often that they get a wake up call. However. He didn't push the issue. So could his pettiness be a sign of insecurity? If so. You might be able to 'reason' with him. Sadly. Sounds like a great series!! Thanks so much for this chance! Loving the sound of this. Thank you. I love Chloe and Roelke! I have enjoyed watching their relationship grow through the series. 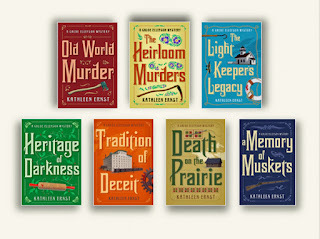 Your mystery series is one of my all time faves Kathleen Ernst. I'd be thrilled to win any of the books in the series. Looking forward to finding out more. Thank you. I think Roelke would know by now to perhaps runs anything by Chloe first! This is a fantastic series! Thanks! I think that it's best to stay quiet. Sounds like a fun read and thanks for this giveaway! This sounds like an interesting read. It's always exciting reading a new author. Thank you! This sounds like an interesting read. I always like reading books from an author I have never read before. Thanks for the chance for the giveaway! Congratulations to Petite! This name came out of the hat as winner in the Chloe Ellefson giveaway.